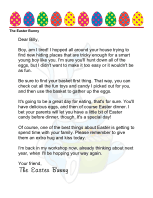 Parents who want alternatives to junk food on Easter can use this free, printable letter from the Easter Bunny that explains why the child will get toys instead of chocolate. 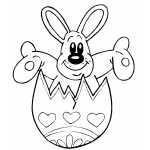 Hello from the Easter Bunny den! 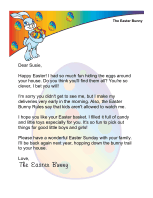 I know that I'm coming to your house soon for Easter, but since you won't be seeing me, I thought I'd write you a little note to say hi. You've been really good this year and so I'm going to be bringing you some extra treats. 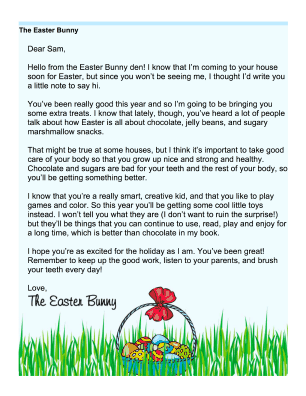 I know that lately, though, you've heard a lot of people talk about how Easter is all about chocolate, jelly beans, and sugary marshmallow snacks. That might be true at some houses, but I think it's important to take good care of your body so that you grow up nice and strong and healthy. Chocolate and sugars are bad for your teeth and the rest of your body, so you'll be getting something better. I know that you're a really smart, creative kid, and that you like to play games and color. So this year you'll be getting some cool little toys instead. I won't tell you what they are (I don't want to ruin the surprise!) but they'll be things that you can continue to use, read, play and enjoy for a long time, which is better than chocolate in my book. I hope you're as excited for the holiday as I am. You've been great! Remember to keep up the good work, listen to your parents, and brush your teeth every day!